I adore English Tudors. I wanted so badly to live in one when I moved this last time (our ninth move!). But, we had a short window of time and none were for sale that would work with our family. We ended up buying a lovely 1930's Royal Barry Wills Center Hall Colonial. Beautiful and historic, but my heart still belongs to the Tudors. A common complaint is that they are dark. 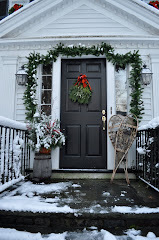 Yes, the smaller windows, sloping ceilings and dark wood can make them feel dark, but I find with the right decor and some modifications they can be sunny, beautiful, and very cozy. Still, I hold fast to my dream that some day I may own an English Tudor. I follow the MLS listings and am always on the watch for ideas and inspiration. So imagine my delight when I saw this new Conservatory Kitchen Addition on this wonderful 1920's Tudor by Barnes Vanze Architects. The owner, a professional chef, wanted to add light to the home and have a "summer style" kitchen. They wanted the addition to have a true garden feel. The result is a beautiful space which incorporates all the conveniences needed for a professional chef and a tremendous amount of natural light which floods into adjoining rooms. The center island is large and great for food prep, as well as entertaining, while the host prepares the meal. It is made of antique, reclaimed chestnut and has refrigeration drawers built into it. Additionally the owners wanted a dining table in the space and a banquette seating/lounge area. 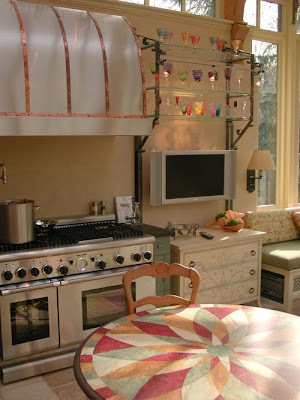 Notice the professional stove and striking hood with copper accents. I also like how they used furniture with the cabinetry. Notice how some of the furniture has strong colors so it doesn't disappear in such a large space. 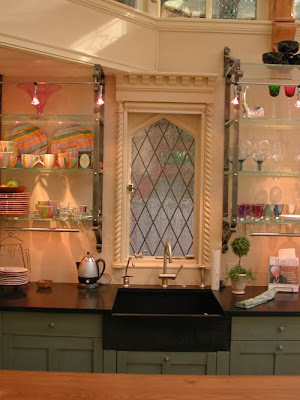 The iron and glass shelves were custom designed and forged especially for their space. There are no over head cabinets. 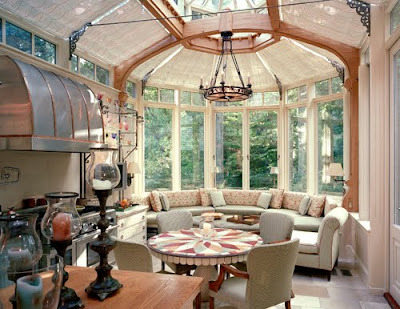 Notice the detail around the window and the ceiling - spectacular! I also love the soapstone sink and gray/green cabinet color. The actual building lot dropped off in the back so the owners were able to create a room beneath the Conservatory. The new space houses a wine cellar, bath and media room. It also allowed the owners to create a new patio/entertaining area. 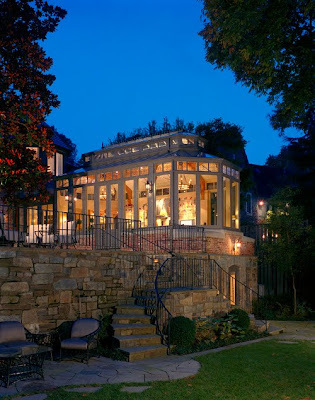 This is excellent example of how the right addition on an older home can completely transform it. Read more about the architects and the fabulous renovation here. 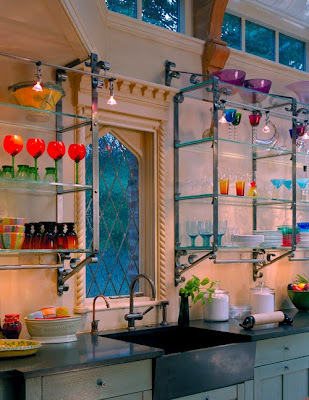 The colored glassware on the glass shelves make the kitchen look magical. That is just gorgeous! Wow! What an incredible space. Wow, what a dream! 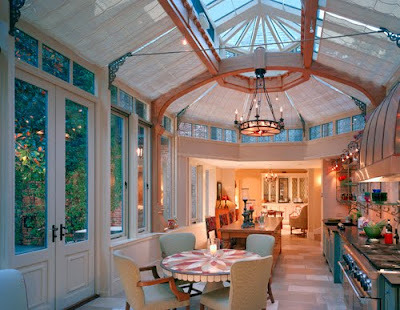 I have always dreamed of having a conservatory, and this one is incredible!! What a fabulous kitchen....I could do some major cooking and baking in that beauty!! Oh, Gina, these pictures make my heart fill with happiness! What an incredibly beautiful, light filled space. Thank you - this made my afternoon! 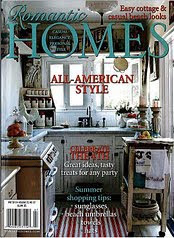 PS - Atlanta Homes and Lifestyles had a pretty Tudor in last month's issue - it is probably online now - I will find it for you. Hi. I just love your blog. I wonder whether you ever provide advice. I ask since your taste is so wonderful. I'm trying to pick a paint color and wonder if you could provide any guidance. 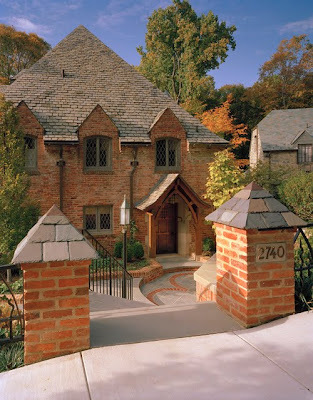 Tudor homes are my dream too. It was so refreshing to see that this one was so light . Thanks for sharing ,it was wonderful. 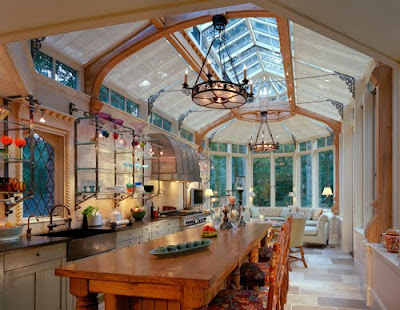 i can not imagine having such a fabulous kitchen. omg, i know this house! someone who worked on it once sent me pictures o it. small small world. What a beautiful and successful addition! First may I say, I love conservatories. They bring in so much light and are so pretty! Secondly, the addition is seamless. There is nothing worse than addition that looks like an afterthought. There's a lot them out there. Attention to detail makes such a difference in the outcome, wouldn't you say? It was great to visit you! I love your blog. I'll be back for more. That is truly a spectacular kitchen! Don't see many glass rooms here in California! Thanks for sharing. Oh am I ever drooling. I LOVE love love Tudor. There is one in my neighborhood that I drive by frequently. Gorgeous and this one is too stunning for words. The light..amazing! I hear you about Tudors! There are a couple old historic ones in my home town and I have always said if I won the lotto I would go make someone an offer on one! Wow, isn't this stunning and amazing. I could move in!!! All that glass and light, great! The natural light in a space like that must be amazing. Willow, I adore Tudor homes also! I think there is like a grand total of 1 in the city that I live in. wow.. the kitchen is marvelous. What a fantastic room - I can understand why you've featured it Gina. At night it has a fairytale quality, so pretty & inviting. And I love that the Owners have different areas set aside in the space for various pursuits, very thoughtful design. Hope 2010 will bring you & your family much joy & happiness Gina. This space is just gorgeous! Funny though it doesn't look like a professional chef's kitchen. Maybe that's what he wanted....something beautiful and not busy with a million copper post & whisks everywhere. I love the tiny track lighting...hardly notice it... just the pretty glass collection. Oh also love the cellar below. Not your standard walk-out basement! To my Friends Around the World!